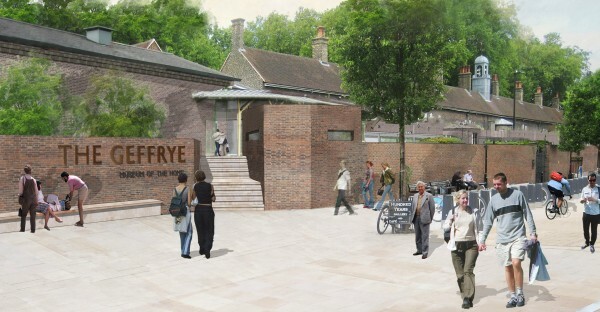 * Update 200515: The Geffrye application to the Heritage Lottery Fund for money to build the substitute scheme here reported has been approved. “Phews!” all round at the museum. AFTER THE fiasco of its failed expansion plan, the Geffrye Museum has unveiled its intended replacement. 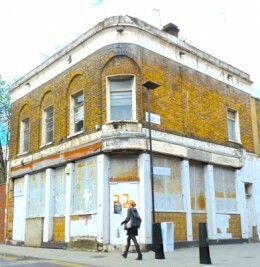 The former Marquis of Lansdowne pub, languishing unlicensed for years at the corner of Cremer Street, Shoreditch, is to be saved, as Loving Dalston exclusively revealed in spring this year 2014. The previous plan to knock it down sparked a furious, and curious, protest by a small band of mediaistas. The museum said: “The organisers of the opposition to the earlier proposed demolition are very happy that the building is to be retained and put to good public use.” The new plan sees it as a café. Scrapping the first scheme, by architect David Chipperfield, has cost the museum £500,000 and will, it admits, harm its chances when it reapplies for the Heritage Lottery Fund millions – at least 15 – that it needs if it is to succeed in its second attempt to, as it says, “unlock” the Geffrye to enhance the visitor experience. obvious idea of using existing space within the museum’s 18th-century, Grade 1 listed almshouses. Areas never seen by the public would be opened. Makes you wonder why Chipperfield didn’t think of it, and of the extra entrance opposite Hoxton station, which is also proposed by W and W.
It suggests that what the Geffrye described to Loving Dalston as the “mutually agreed” end of the museum’s relationship with Chipperfield came not a moment too soon. No compensation will be paid for stripping Chipperfield. That is unlikely to be the end of the museum’s troubles. Now it has to sell its new scheme to the public and Hackney planners, at the same time as retrying to extract huge amounts of money from public funders. 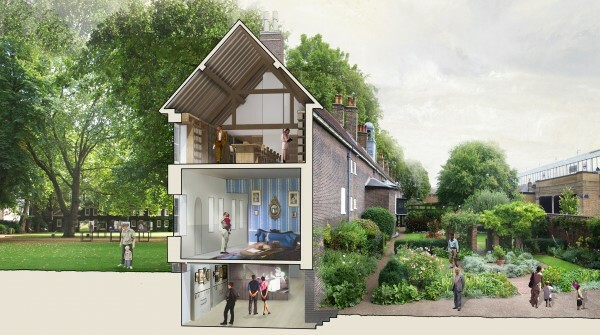 * A display on the new scheme, including the architect’s model, is at the Geffrye for the next few months for visitors’ comments. On Tues 4 Nov 2014 from 6pm-7.30pm, at the museum, the architect and museum director David Dewing will answer questions from the public. * Backstory: Pub saved in Geffrye revamped revamp. 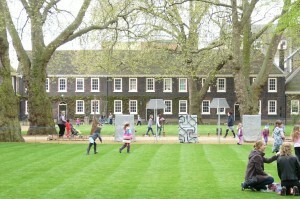 * The computer-generated images on this page, with their preponderance of white faces, have been supplied by the Geffrye, the photographs by Loving Dalston. Hackney has a treasure trove of ancient artefacts that can be placed on display at the museum and which is of great importance and interest to many who would possibly pay a reasonable entrance fee to see.